As you may have guessed, the tradition of the Christmas tree extends back hundreds of years. Yet, like most traditions, it’s hard to really tell when the tradition precisely began. The first written record of a decorated Christmas tree comes from 1510 in Riga, Latvia. It was decorated with roses in the marketplace by members of the local merchants’ guild and was meant to be a symbol of the Virgin Mary. The Germans introduced the Christmas tree to America, but it was at first not accepted. They saw Christmas as a sacred holiday and looked down on decorations as pagan. In 1659, the General Court of Massachusetts even made a law that any observance other than a church ceremony on December 25 illegal; you could be fined for even hanging decorations. 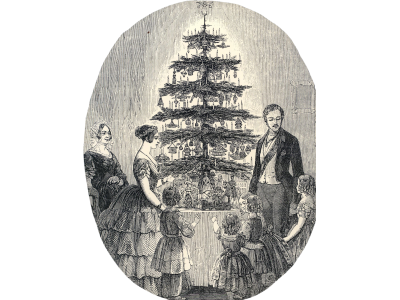 It wasn’t until 1846 that the Christmas tree became accepted, thanks to the fashionable Queen Victoria who had her family’s illustration done around a Christmas tree. By the late 1800s, the Christmas ornaments started arriving from Germany, and decorating Christmas trees was on its way to becoming tradition. At first, ornaments were glass balls, but that quickly evolved to chains of balls, toys, and figures. In the early 20th century, Americans began using homemade ornaments (while the Germans continued to use apples and nuts) and then dyed popcorn strings. Eventually, the introduction of electricity made it possible for the Christmas tree lights. In 1901, the first Christmas tree farm in the United States was started by W.V. McGallliard of New Jersey. At this same time, Theodore Roosevelt tried to stop the tradition of Christmas trees with concern of the destruction of forests. Luckily for us, his two sons got the help of Gifford Pinchot to change the president’s mind, declaring that if done properly, the tradition was not a threat to forests. Today, as we all know, the tradition has carried on, and many tree plantations now exist. At Christmas Farms in southwest Michigan, we carry on the traditions or forefathers left for us. We offer a variety of Christmas trees, wreaths, garlands, and holiday greens. On just more than 100 acres, we have more than 100,000 trees growing at any given time. Some of our most popular trees include the Fraser Fir, Douglas Fir, Balsam Fir, Blue Spruce, and Scotch Pine. We deliver throughout the United States and make sure that your tree is fresh and ready to decorate. We bring the tradition of Christmas trees, quite literally, to your door.